Very interesting statistics today from Johan Myrberger at The Killer Attitude. He has taken Jeff Pulver’s statistics one step further, with detailed graphs. 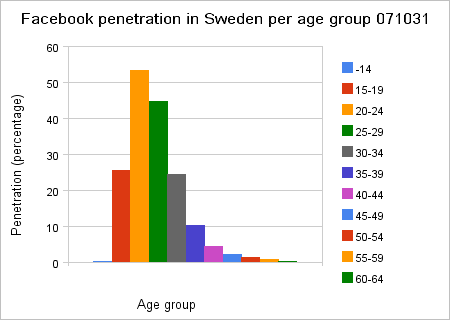 Sweden has close to one million Facebook users. One million. In a country of nine million people. That is pretty amazing. Finally Aftonbladet has started to automatically link to blog posts linking to its articles. Certainly not first in Sweden, but in my opinion one step further than the others. Big disclaimer: I am very much involved in this, so expect some bias. 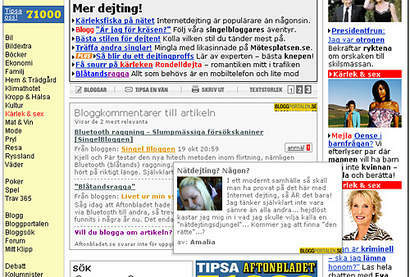 Swedish company Primelabs has provided MSM with blog link widgets through its Twingly service since February. Dailies DN and SvD were first out, followed by among others Idg, Dagen and Mindpark. While this is a great service, some of the sites only show the headlines, without even mentioning from which blog the headline comes. We wanted to do more, to provide a tool to give an instant idea of what the blogosphere is saying on a topic, and also to guide the readers so that they know before they click on a blog link not only which blog it is, but also who is behind it. In Aftonbladet’s blog listings, which come from the blog catalogue service Bloggportalen, you get the headline of the blog post (linked to the post), you get the name of the blog, and if you hover your cursor above it you get a photo and information about the blog/blogger. There’s also a three line excerpt from the post. So far the initiative has received mainly positive feedback, though some concerns have been voiced that the blogosphere will become less interesting if it starts to follow the agenda set by MSM even more than today. I think this might be true to some extent, but I also think there are a lot of bloggers out there who blog not only for the traffic but because they have something important to say, and they will keep saying it. I also hope that MSM will learn to showcase great examples of uniqe topics and angles from blogs. This is certainly my ambition in my work at Läsarbladet. Digga and Sovrat have been cometitors from the start in the struggle to create a Swedish equivalent to popular American site Digg. At the end of September, Digga was contacted by Digg, who asked them to change names since Digga was too similar to ”Digg”. We then thought it was time to stop competing and instead merge into a strong and unified site.